An estimated 3.5 million Cambodians can speak English. Not so long ago, Pors Socheata picked up a copy of the British journalist Jojo Moyes’s critically acclaimed novel Me Before You, a romance that was adapted for the silver screen. Hooked, she soon devoured Moyes’s sequel, After You. It was not the first time that Socheata, 27, had exposed herself to foreign culture through books. Along with her two sisters, she has read hundreds of fiction and non-fiction books since high school, joining the ranks of young Cambodians who read for pleasure. Socheata is one of thousands of her generation who are regularly using the English language to communicate at school and in daily life, for education, to receive information and increase her job prospects, as well as for entertainment. Cambodian scholars have both promoted the use of English as a way of connecting with the outside world, and also raised concerns about the effect its widespread use could have on Cambodian culture. Socheata says her facility for the language did not materialize overnight. Pors Socheata said that English allows her to go to everywhere in the world. She was fortunate enough to be sent to one of the country’s top English-language elementary schools, where she practiced reading, writing, speaking and listening, before going to the Australian Center for Education, or ACE, at high-school age. In ACE’s library she found her calling, taking in book after book from the repository’s shelves. Wearing light blue denims, a shoulder-cut shirt and only a touch of makeup, Socheata does not look like your typical Cambodian of her age. 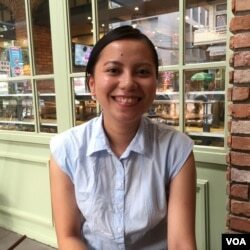 Smiling confidently, she told VOA Khmer how she won an international peace scholarship to attend university in Australia in 2009 while in her third year at the Institute of Foreign Language in Phnom Penh. Without English, she says, she would have likely missed out on the opportunity. “It’s important for Cambodian students who need a scholarship, they have to know English,” she said. She gained a master’s degree in multimedia design from Melbourne’s Monash University, returning to Cambodia and taking up a position as a lecturer at Limkokwing University and later securing a role as a digital producer for a private company. “When I know English, I could understand other cultures and I could study easily as when I started speaking English, I also started using the Internet and email,” she said. “If want to learn more things, I could search it on the Internet conveniently. And another thing, it is easy to interact with various nations,” she said. Besides having an opportunity to explore the world, the language skills allowed her to explore other cultures. “Malaysians and Indonesians have their own language, but they speak English. When we know English we can communicate with them,” she said. Socheata said that English allows her to go to everywhere in the world. “Whichever airport we go to, there are always signs in their own language and the English language, so even though we do not know their native language, we can still go to those airports easily,” she said. Now a financially independent young woman, she is working as a communications officer at Room to Read, an NGO working to promote education in Cambodia, which involves travel to many provinces around Cambodia. Her experience of living alone in Australia has earned her parents’ trust. Though Socheata thinks English is an important tool to self-teaching, she also sees some difficulties. “There are some setbacks, but it depends on the individuals. Some people when they can speak English, they look down on others who do not speak English, but that depends on the individual because they might think they are smarter than the others,” she said. “The other negative point is that when we can speak from two to three languages, we often confuse the language. 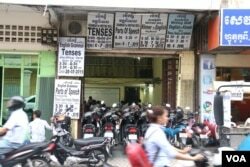 I, for example, when I speak Khmer sometimes I cannot respond in Khmer words, so I use a few English words. This is hard to stop. It happens automatically,” she said. Sok Soth obtained his doctorate in education from Victoria University, Melbourne, in 2013. He teaches and researches applied linguistics at the Royal University of Phnom Penh’s foreign language institute, and says that his research shows that English is having an increasingly profound impact on Cambodian identity. “English language stimulates critical thinking. Personally, I’ve noticed that those who learn English are adroit at critical thinking, analyzing and debate,” he said. Soth added that those who communicate in English tend to be more open to act more independently and against their parents’ wishes. Also of note was a shift in the fashion and speaking style worn by English-speakers. “We cannot stop change,” he said, adding that it is very important that students, parents, and teachers know that students’ personalities will change once they are proficient English speakers. 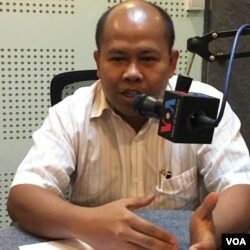 Ros Salin, Ministry of Education spokesman, acknowledged there were drawbacks to Cambodians speaking English, but said the benefit of being able to speak and use English surpassed any handicap. He added that the language is very important for Cambodian youth today to be ready for challenging job markets at home as well as in the region. “Generally English is an international language, and the Asian context, since 2016 … English has been determined as an official [Asean] language,” he said. Salin said that the government has put the language in the school curriculum to improve the standard of graduates’ English. “The English language is very important for them, and the ministry sees that it is a must, so the minister has put it on the study curriculum since grade four, so that students could learn English starting from the lowest basics,” he said. He estimated that about 3.5 million Cambodians can speak English. “English is a must and positive point. These people are strong, especially women, whey they speak English, they understand the world, they could enhance their own capacities. This increases autonomy in the families,” he said.